Different business users ( Example : HR / SRM ) want to see their work items/tasks in portal under different roles with different navigation's if possible. Business users already using the UWL. UWL Configuration already done with the back end systems. Check the important properties to use multiple UWL features. 2. Navigate to System Administration -> System Configuration -> Universal Worklist & Workflow -> Universal Worklist – Administration and Choose Click to Manage Item Types and View Definitions. Observe several xml files Example uwl.standard related to "Default View" XML tags and "Main" Navigation Node tags and customize / Create new XML file to suit business requirement of new UWL display and functionality. 3. Copy Standard UWL Iview into custom folder , Rename iview and the properties sap_uwl_viewname and useNavigationId to use custom views and navigation. 4. Add this customized iview to any role as per business requirement . 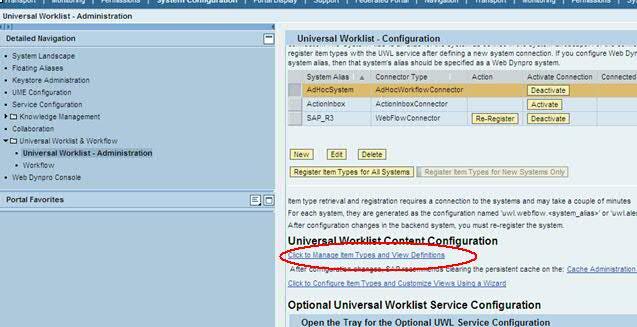 In this way , multiple UWL's can be maintained in single SAP Portal system.